The last in line of the second generation software, ISL Groop 2.3 brings a lot of improvements in sharing live content like an application or the whole desktop. Live screen sharing is now not only much faster but more intuitive and easier to use. 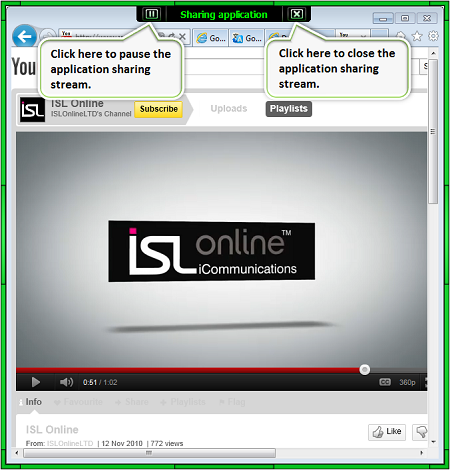 ISL Groop recognizes open applications, highlights them and suggests them for sharing. So, to share your screen or an application, you can just click on one of the highlighted applications. The new release also works better in networks with lower bandwidth as it auto-detects each user’s Internet connection speed and adapts the quality of the sound and video streaming accordingly. Our PR team has written a nice long article regarding the ISL Groop 2.3 new release, which you are welcome to read. Otherwise, dig into the release documentation for fine details. To start sharing an application with other meeting attendees, first make sure the application is open and not hidden behind other applications. Then, either create a new slide and choose ‘Screen share’, or simply click the ‘Live screen’ button in the main toolbar (upper left corner). Scroll the mouse over the application until it gets highlighted and click on it (tip: if you have forgotten to put the application on top and thus can’t see it, Alt-Tab to it). That’s it, you are sharing the app! During the app sharing, one thing you should probably know is how to pause your stream to let’s say show something relevant on another slide. To pause application sharing, just click on the button on the left in the application sharing bar. Minimizing the application you are sharing will result in your stream pausing as well. To continue sharing, you need to click the play button or just restore the application if/when minimized. Once you have started sharing an application, you may resize it to any size– maximize it, restore it down, restore it up again – and the sharing region will always adjust to the new dimensions. To avoid situations when you’re not fully confident of what you are actually sharing, read this tip. The application sharing window, easily recognizable by its green frame, is an active area and anything that’s inside that window will be streamed to the meeting attendees. If you move another app over the region inside the green frame, all attendees will be able to see it. This entry was posted in ISL Groop, online meeting, web conferencing, webinar and tagged application sharing, live sharing, online meeting, screen sharing, software, video streaming, web conferencing, web meeting. Bookmark the permalink. Very nice post. 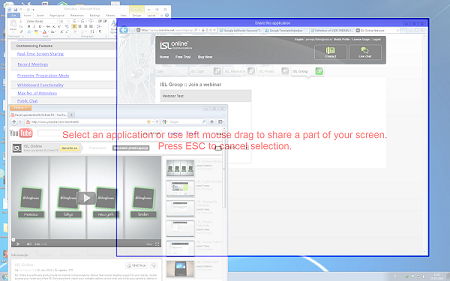 I would like to point out additional info – remote control is no longer available in ISL Groop 2.3 screen sharing.